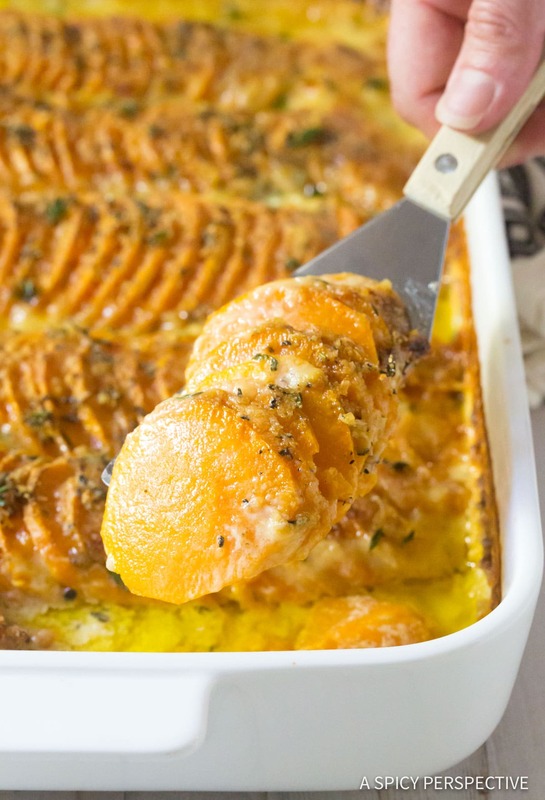 Silky Garlic Butter Scalloped Sweet Potatoes – A luxurious creamy sweet potato recipe, layered, with cream, cheese, butter, herbs, and garlic! Today I’m sharing the most opulent, velvety sweet potato recipe you’ve ever tasted. And you thought sweet potatoes with marshmallows were lavish. Although I realize traditional marshmallow-topped Thanksgiving sweet potatoes are placed by many on a high pedestal, there are those of us who like to occasionally serve sweet potatoes without added sugar. That’s not to say we (ok, I) don’t add a whole lot of naughtiness, other than sugar. Classic sweet potato casserole is delicious. Yet this year, if you are looking to make something a little off the beaten path, yet not so much that your family will be disappointed, you’ve got to try our Garlic Butter Scalloped Sweet Potatoes. Rich, silky and popping with garlic butter flavor, these savory sweet potatoes are to die for! 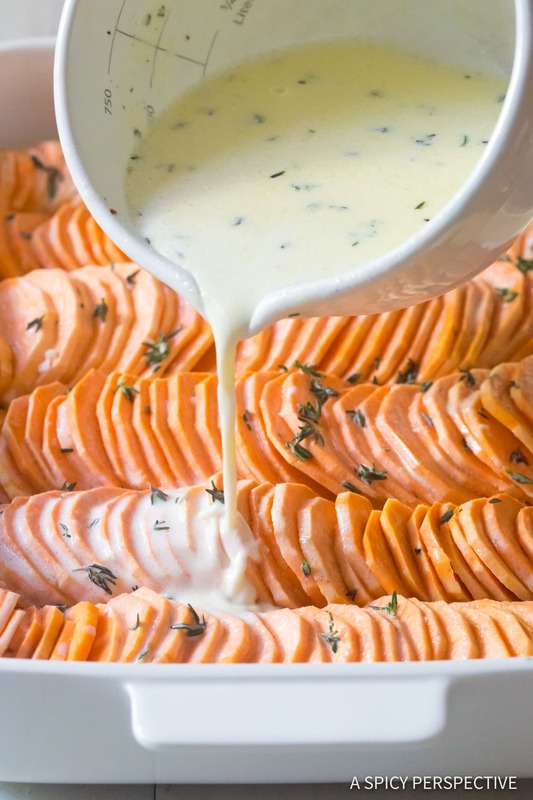 Mix the Cream Topping – Combine all the ingredients, except the sweet potatoes and cheese. This should be done first so you can quickly pour the mixture over each sweet potato, to ensure they don’t brown. Peel and Slice the Sweet Potatoes – Peel the sweet potatoes one by one. Take care to slice each potato into very thin rounds, to create a delicate texture after baking. Arrange and Coat – After slicing each sweet potato, arrange the slices in a pretty pattern in the baking dish. The pattern you choose is entirely up to you. Pour a little cream mixture over each potato, before slicing the next one, to slow oxidation. Bake – Bake the sweet potatoes until soft. Then sprinkle with parmesan cheese and bake a few more minutes. 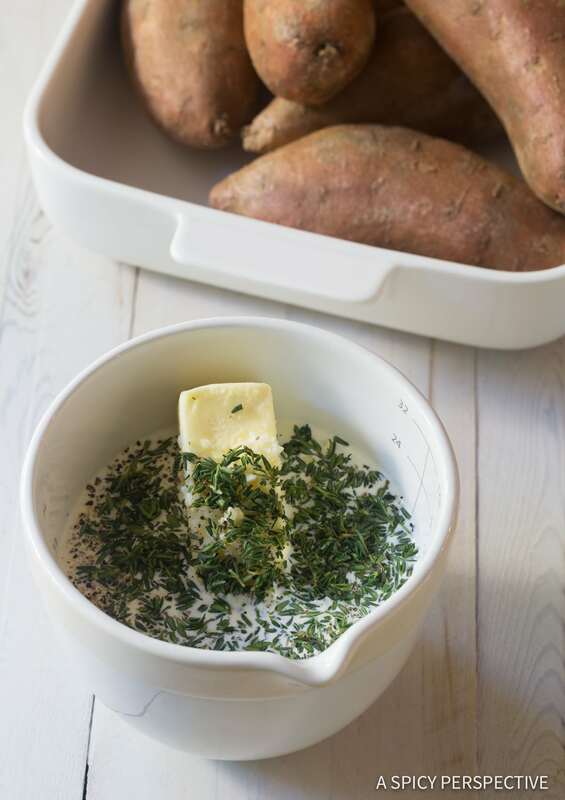 Get The Complete Garlic Butter Scalloped Sweet Potatoes Recipe At The Bottom Of This Post! 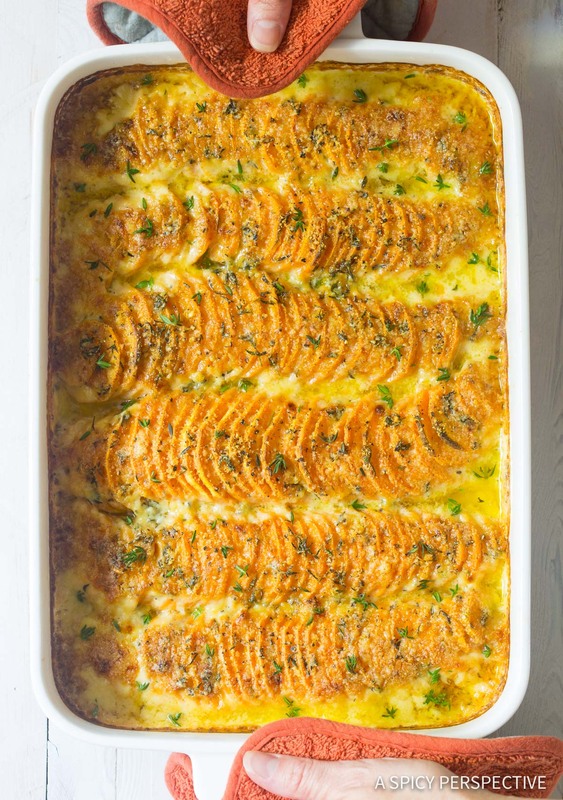 Can this recipe be made with other varieties of potatoes? Absolutely. Feel free to use white or purple sweet potatoes, as well as russets and new potatoes in this recipe. Cooking instructions will stay the same. 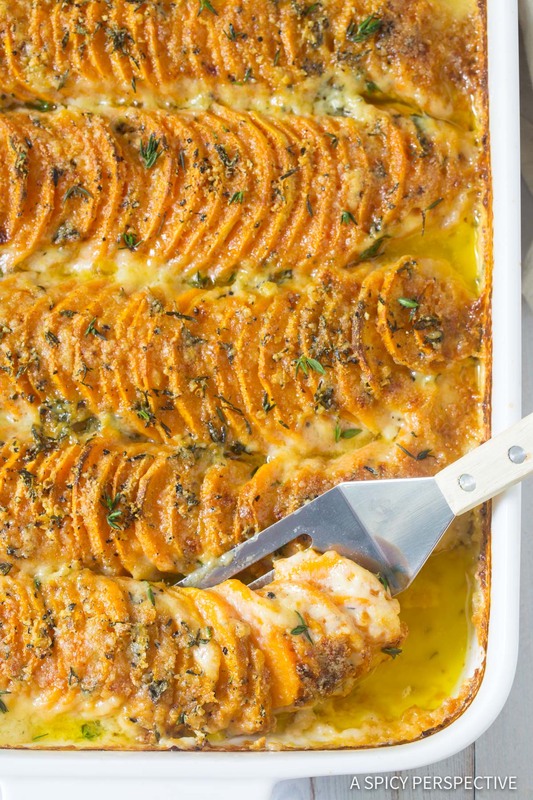 Is this Garlic Butter Scalloped Sweet Potatoes recipe gluten free? 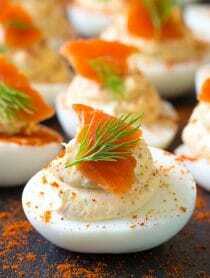 Is this recipe low carb, paleo, or ketogenic? No. Sweet potatoes are starchy, therefore they do contain ample carbs. 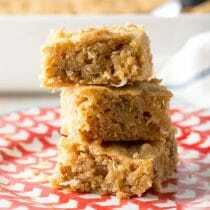 However, if you remove the cornstarch and use arrowroot powder instead, this recipe is grain-free. Can I make a dairy free variation? Yes! 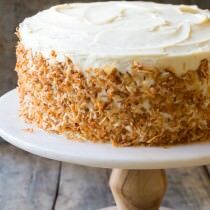 You can substitute thick coconut milk for the cream, and vegan butter for regular butter. Then omit the parmesan cheese. PS – If you happen to do this, and use arrowroot powder instead of cornstarch, then the recipe is paleo-friendly. Is there a low fat version of this recipe? Hmmmm… You could omit the cream and butter. Then brush a little olive oil over the top of the sweet potatoes, and add the garlic and herbs. 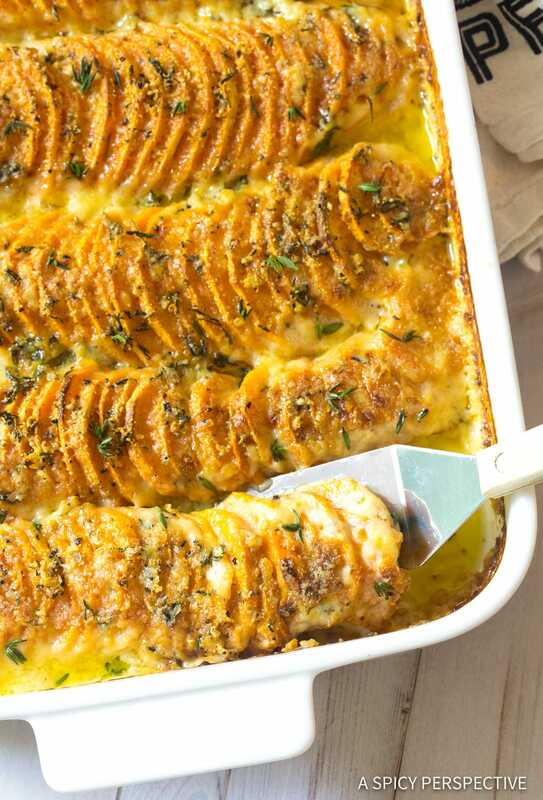 The scalloped potatoes will not have the same silky luxurious texture in the end. However, they will be soft and herbaceous. Due to the cream and butter, I wouldn’t. Can I make this recipe ahead? Yes. You can prep and bake these scalloped sweet potatoes up to 3 days in advance. Then reheat in a 350 degree oven for 20+ minutes. 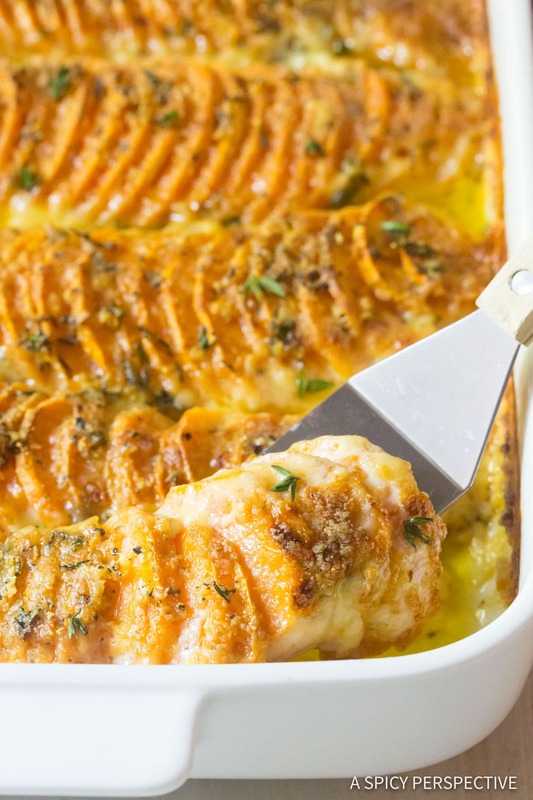 Garlic Butter Scalloped Sweet Potatoes Recipe - A luxurious creamy sweet potato recipe, layered, with cream, cheese, butter, herbs, and garlic! Preheat the oven to 400 degrees F. Pull the leaves off the thyme stems. Discard the stems and roughly chop the leaves. Place the cream and cornstarch in a small bowl or pot. Whisk well. Add the butter, garlic, thyme, 1 1/4 teaspoon salt, and 1/2 teaspoon pepper. Heat over the stovetop, or in the microwave, just until the butter melts. Then turn off the heat and whisk again. Peel and slice each sweet potato one by one. Slice the potatoes into very thin rounds, 1/8-inch thick. 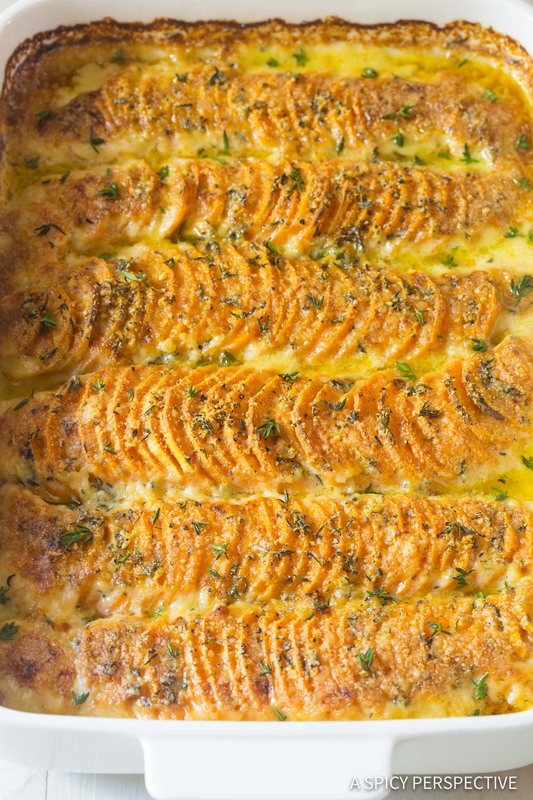 Arrange each potato in a 9x13-inch baking dish, fanning it out in a pretty pattern. Before peeling and slicing the next sweet potato, pour a little of the cream mixture over the potato slices in the pan, so it does not brown while you work on the other potatoes. 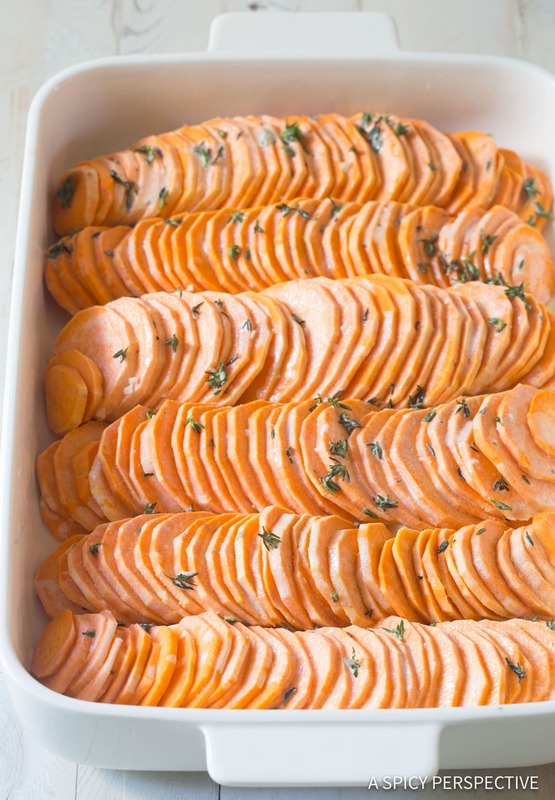 Repeat until all the sweet potatoes are sliced and arranged prettily in the baking dish. Then pour the remaining cream mixture over the top. Bake for 30 minutes. Sprinkle Parmesan cheese over the sweet potatoes. Then bake another 10 minutes until the cheese is golden. Serve warm. Sweet Potatoes! Yes! What a fabulous idea! Can’t wait to try them! WOW!! Such an incredible side dish!! My family would LOVE this! These look so good! 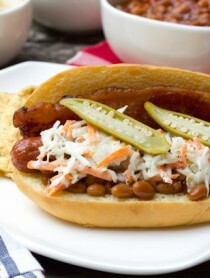 I’m definitely adding these to our dinner menu next week! 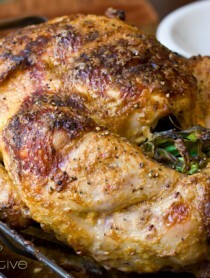 This is a perfect dish to add to any dinner!!! Sounds so delicious! I’m cooking this right now, but I’m not serving until 6:00 pm tomorrow. How do you recommend reheating this recipe? I would just place it back in the oven at 350 for about 15 minutes. My family loves sweet potatoes! 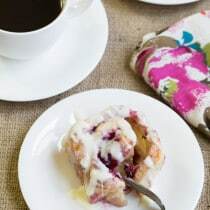 I am making this dish this weekend! These are exceptional. So delicious. Such a flavorful side dish! And easy to make. Such a delicious side!! YUM!! 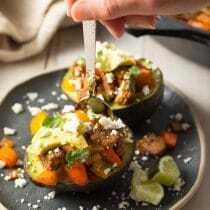 what a great way to enjoy sweet potatoes!! thanks! These look really good, I love savory sweet potatoes and will be trying to make this soon!